Abdali is Amman’s new downtown district that provides the Jordanian capital with a central business, social and residential destination that the city requires as a regional hub of business and tourism. In Abdali there have been many modern and luxury buildings developed. Towers, residences, business centers and commercial areas have been developed with a total value of more than 5 billion USD. A lot of green areas, parks and a central Boulevard have also been included in the project for the people to get around on foot and enjoy the scenery. This iconic project is projected to be a reference in the Middle East for similar developments not only because of its clean, modern aesthetics, but also because of its sustainability: all the buildings within the complex will be LEED certified. To achieve this certification a lot of measures have been implemented for energy efficiency including a state-of-the-art District Cooling plant. The weather in Amman is extreme: really high temperatures during summer and freezing night-time in winter make it difficult to live indoors without heating and air conditioning. District cooling was selected as the most efficient and reliable solution for the chilled and hot water supply of the new development. The total cooling capacity was calculated to be 52,000 TR. Efficiency is a crucial parameter for these kinds of plants, as the amounts of energy consumed throughout the year is very high. Any improvement in efficiency results in huge savings in any developer’s running costs. Amman has an extra handicap: water availability is scarce. A typical 52,000 TR cooling plant’s water consumption is way out of the range that Amman can supply given the conditions of the region. In order to avoid the problems of water consumption and a water treatment plant, ARANER proposed a design based on air cooled chillers with zero water consumption. The benefit of a cooling tower when compared with an air cooled chiller is not that high and may not really compensate for the additional water consumption. This is the case in Amman where the temperature at night decreases drastically and is close to the wet bulb temperature. 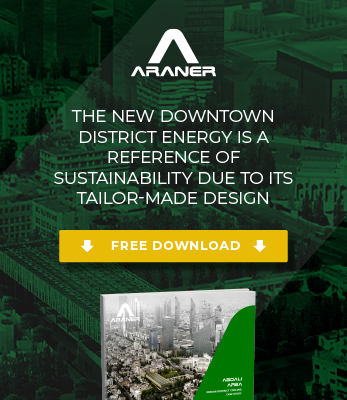 ARANER’s air cooled chillers are able to achieve almost the same yearly average COP as a system based on cooling towers but with zero water consumption. The high performance results of the final cooling plant with ARANER products have been certified by several international consultants and by the Jordanian Royal Scientific Society. These incredible results were achieved by implementing three products in which ARANER is a leader. How did ARANER get this challenge done? Download the full case study for free and get all the details. What about the initial cost comparison ? Believe it or not, this solution was even less expensive!!! We managed that thanks to the Thermal Energy Storage design with optimised diffussers, together with the special chiller for high condensing temperatures.